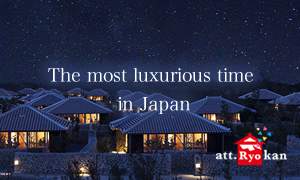 People carry around omamori as a wish for good luck, bringing of happiness, and expelling of evil. 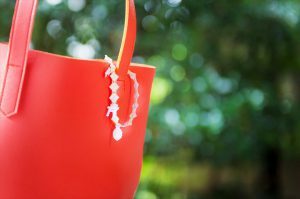 Traditional omamori are in the shape of a small pouch, but there are now new types of omamori with unique shapes. 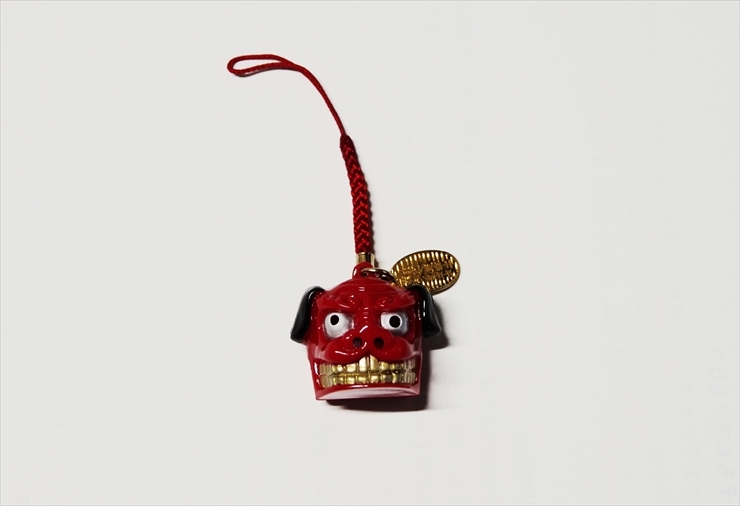 Omamori from shrines and temples are amulets or lucky charms, which are considered to contain the power of a god or Buddha within. People carry them around on themselves, their bags, or in their wallets, in a wish to avoid disasters, protect themselves, get involved in a good romance, or get lucky in money. At shrines, it is said to be better to pray after first getting an omamori. What is the efficacy of Omamori? 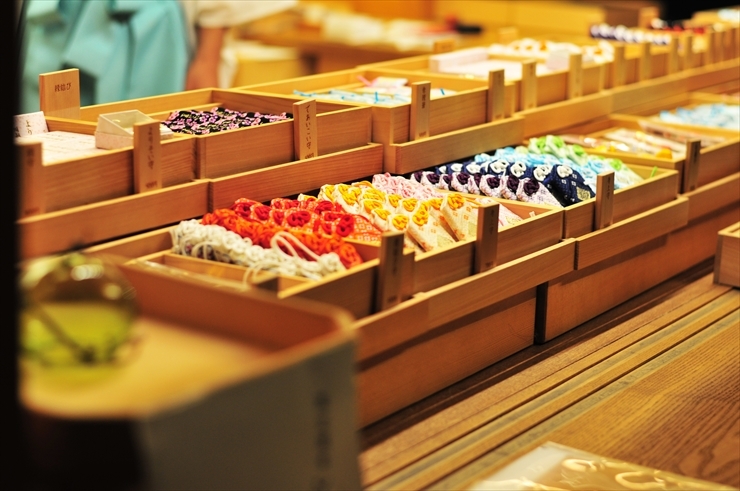 It is said that omamori are effective for one year in many cases, so it is common for people to bring back their omamori after one year to the original shrine or tem ple and get a new one. 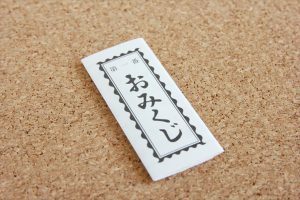 If it is difficult to return your omamori to its original place, you can dispose of it wrapped in a sheet of white paper, according to some shrines and temples. 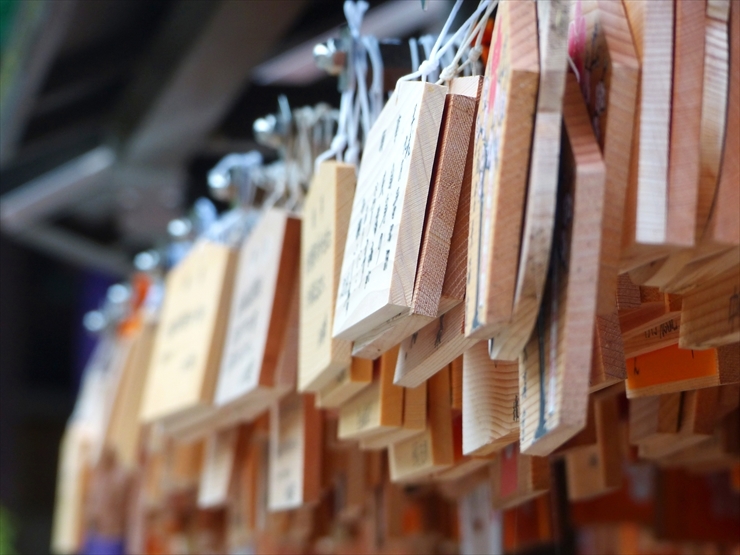 At shrines and temples, omikuji and ema are as popular as omamori. 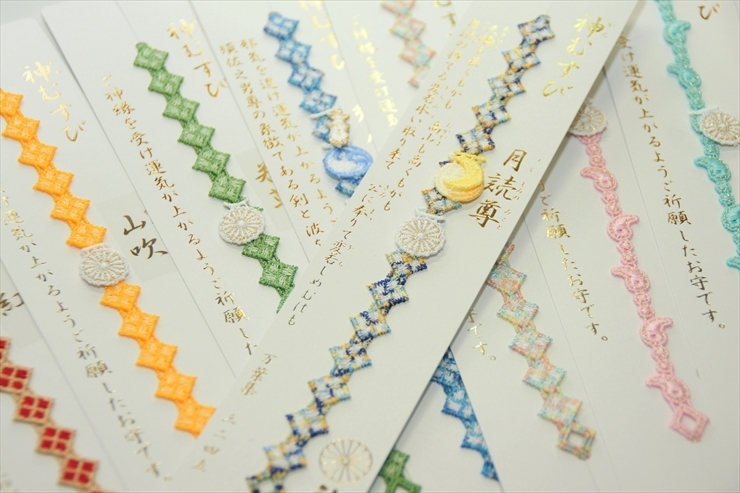 Omikuji are fortune-telling paper strips, which tell your fortune with several levels of blessings and curses. 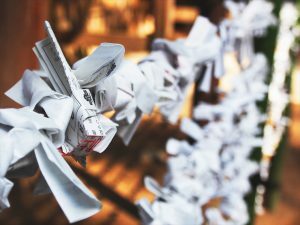 Get one omikuji, read it, and tie it to a designated place, such as a pole or a tree, on the premises to create a good connection. If you want, it is okay to bring it back with you. An ema is a wooden tablet on which you write down your wish and/or appreciation of your granted wish, and then it should be left at the shrine/temple. Traditional ema often have a drawing of (a) horse(s), which is considered a vehicle of the gods, but there are now unique ema with anime characters. 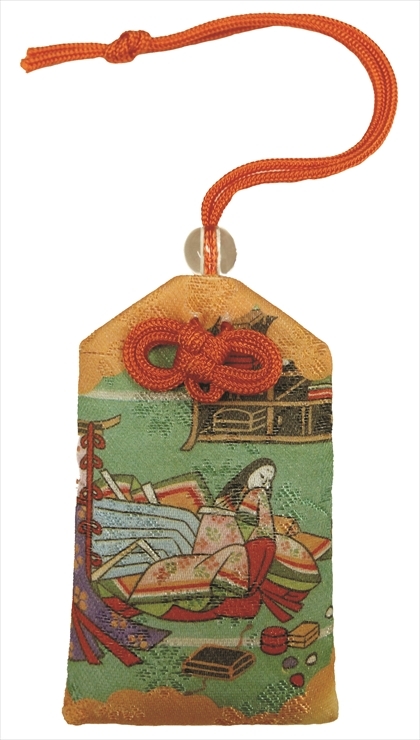 This bracelet-type omamori made with lace can be attached to your wrist or bag handle. Some colors are available only for a limited time. 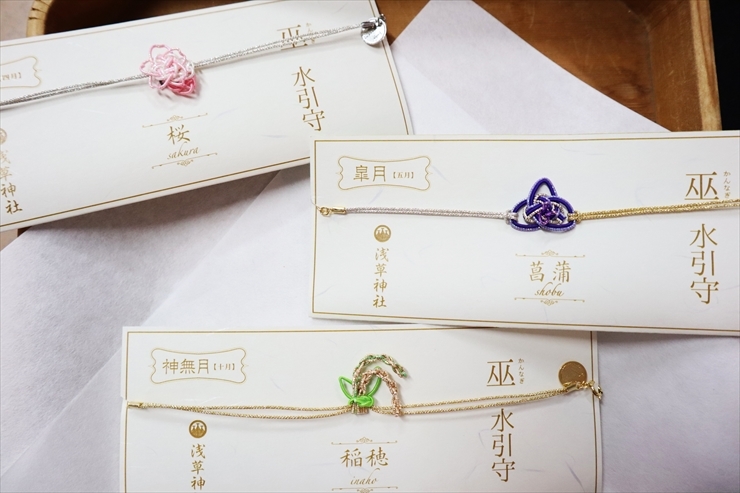 This bracelet-type omamori is designed with a motif of “mizuhiki,” special decorative cords used for special envelopes for monetary gifts. One hundred omamori are available each month, with different patterns for different months. 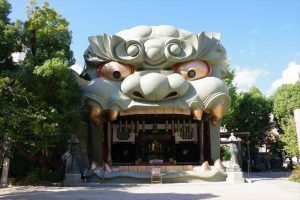 With scary statues of shishi (lion) at the front, the shrine offers various omamori with unique shapes, including “shishigashira-mamori”for expelling evil and “randoseru-mamori” (child-school-bag-shaped mamori) for academic improvement and safe travelling to and from school. Worshipped by people as the god of good romance, good children and safe delivery, Nonomiya-jinja Shrine is depicted in Genji Monogatari (The Tale of Genji), a full-length work of Japanese literature written in the 11th century. Among other omamori, ones with a drawing of a scene from Genji Monogatari are especially popular. 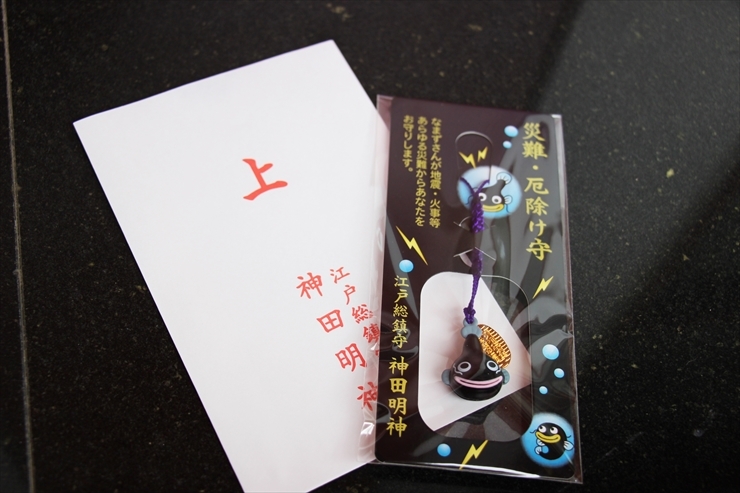 Namazu-no-omamori (catfish omamori) are for wishing for no natural disasters. There are also other kinds of omamori, including ones with anime characters such as the anime series “Love Live!”. 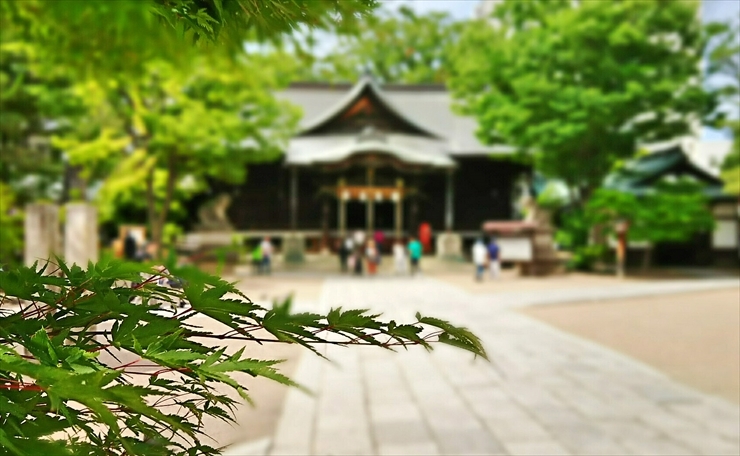 There are various opinions about how to pray at shrines and temples. 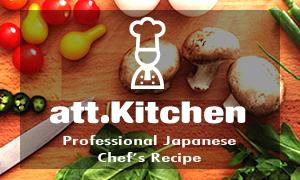 In the following section, general methods are introduced. Regardless if you are at a shrine or a temple, it is important for you to pray quietly, showing respect for the gods and Buddha. (1) Go into the premises after bowing once. (2) Wash your hands and mouth with the water at a €sl157€slmult0 chozuya follows: use a dipper to dip a cup of water for washing your left hand, right hand, mouth, left hand, and the handle of the dipper in this order. (3) Put some money (saisen) in a saisen box (as an offering to the gods or Buddha). (4) Bow deeply twice, clap your hands twice, pray while putting your palms together in front of your chest, and bow deeply once more. (5) Bow once more upon leaving the premises. Follow the above steps (1), (2), and (3) in the case of shrines. (4) Close your eyes, put your palms together in front of your chest (gassho), and pray. At the end, bow once. Follow the above step (5). *In this article, general manners and ways are introduced. They may vary depending on the shrine and temple. *The information herein is as of November 2018.